Martin Allen heaped praise on his “mentally injured” Chesterfield side on Saturday, after they came from behind to earn a 1-1 draw at fellow National League strugglers Maidstone United. 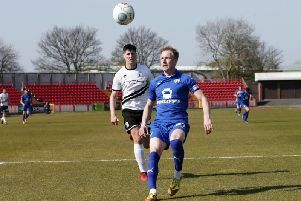 The Spireites dominated the first half at the Gallagher Stadium, but fell behind on 31 minutes when Blair Turgott pounced on a Laurence Maguire error and needed a 74th-minute equaliser from Marc-Antione Fortune to rescue a point. “I thought they showed great guts and great character,” the Chesterfield manager said. “They’re a young team. Certain players played out of position because we didn’t have anybody else. “We had a few injuries and the whole group are mentally injured. They’re worried and they came out and put on a really good, hard-working performance. Chesterfield’s luck showed no sign of improving when Charlie Carter, arguably their best player in the first half, was forced off after an awkwardly landing. And Allen admitted he was exasperated to be 1-0 down at the break. “I think they had one shot in the first half and they must have had ten or 12 opportunities to score and it’s better to have than than none,” he said. “We’ve had games where we haven’t had any and at half-time we were scratching our heads and thinking how the hell are we not leading this game? Chesterfield were understandably cautious in the closing stages but Allen insisted they hadn’t settled for a point. “They (Maidstone) had a couple of opportunities but we were also looking to try and win the game and not just sit on the 1-1,” he said.